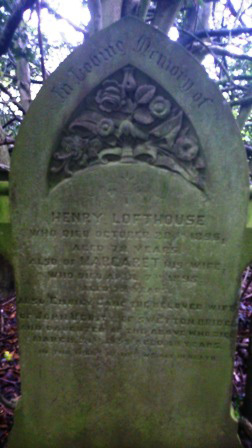 In memory of HENRY LOFTHOUSE WHO DIED OCTOBER 28TH 1896 AGED 78 YEARS. ALSO OF MARGARET HIS WIFE WHO DIED APRIL 7TH 1895 AGED 72 YEARS. AND DAUGHTER OF THE ABOVE WHO DIED MARCH 21ST 1895 AGED 48 YEARS.